Could this ugly duck save the world? I had Muscovy ducks when I was kid. The first one came from a place where they had taken over a creek bed in Lewis County, West Virginia, and they had bred up into near plague proportions. And my grandpa caught my first Muscovy. For some reason the duck imprinted on two hyperpredatory dogs, who strangely accepted the little peeper as a pup. However, the little duck didn’t follow canine decorum around the feeding bowl, and Frito the elkhound went to discipline his charge. And the little Muscovy was no more. The next duck came from a poultry fancier who hatched out her ducklings under a “banty hen.” This duckling was only a day old when I got her, and she strongly imprinted upon me. She followed me everywhere, running hard to keep up. She was named “Chester” under the assumption that she was a male, but then the next spring she started laying eggs. So much for that name! She lived for several years, but she eventually met her demise from a predatory dog attack. These ducks were just pets. It didn’t even cross my mind that anyone should eat a duck. I also didn’t even know the proper name for the species. I thought they were “whispering” or “quackless” ducks. I actually thought that was their name. And the fact that I couldn’t tell the gender of my duck after she matured really showed my ignorance. A Muscovy drake is a massive creature with lots of nasty caruncles on the head. Chester was a petite duck with a gentle little pipping call. I’ve generally not thought much about these ducks, but because I’m interested in ducks again, I am starting to realize some things about Muscovy ducks. 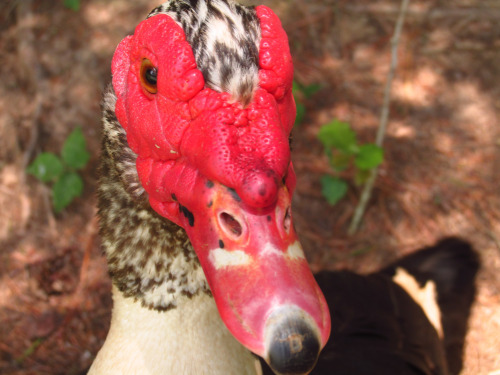 Muscovy ducks have the potential to save the world. I know that might sound like a grandiose claim, but allow me to explain what I mean. Muscovy ducks produce a dark red meat. Their breasts have been compared to beef in terms of flavor and texture, and in a world that is under siege from belching, farting, forest and grassland destroying cattle, the Muscovy duck could hold the key to producing a red meat that is much more sustainable that cattle ever could be. A Muscovy drake can weigh more than 10 pounds at only 90 days of age, and it can reach that size eating very little grain. Indeed, in warmer climates, they can get a lot of their food from foraging alone. They also breed very easily. Pretty much all you need is a drake and some hens, and they will start laying eggs and hatching ducklings. In Florida, the canals are full of these ducks, which are now almost like aquatic pigeons. They can raise three or four clutches a year, and these clutches can have 15-20 ducklings in them. They do very well in warm climates, and if we want people in developing countries in the tropics to have a sustainable source of red meat, the Muscovy duck could be a really important resource. Now, it is well-known that the world’s current consumption of cattle is unsustainable. We can’t grow enough grain to feed them, and we just don’t have enough pasture to run them. Cattle produce quite a bit of methane, which means they are part of the climate change problem. If the whole world starts to eat beef like North Americans do, we are asking for an ecological disaster. Muscovy ducks might be a way of getting a “beef substitute” that is truly sustainable. Of course, these ducks do have their problems. They don’t do well in the coldest places in the world. They also can be vectors of poultry diseases. They also can go feral and displace native waterfowl. However, they still have the potential to provide a much more reliable source of red meat than cattle do, and this is something that needs to be considered within the framework of sustainable development. If we do, these ugly ducks might hold the key to saving the world. I would add emus and ostriches to that list as well. I tried emu once. After a couple of bites I fed the rest to my dogs. There were once about 60 million bison in North America doing what cattle are doing now. I wasn’t aware that the buffalo hunters who nearly wiped them out were doing the planet an ecological service. Some cultures are never going to eat beef in the quantities westerners do, they simply prefer pork, chicken, and goat. I don’t think American beef lovers are going to go for Muscovy duck as a substitute for beef either, especially if they like their beef rare. Ironically, if the numbers on Wikipedia are to be believed, the country with the largest number of cattle is India where comparatively little beef is eaten at all. The reason cattle numbers are becoming a problem still boils down to too many people.